This tasty vegetable has a reputation as a finger food. But be careful. It is only considered finger food when served separately as a cold dish on its own plate. In that case, you can pick up the asparagus by its stem end and take a reasonable bite from the tip. Of course, you don’t have to eat it with your fingers. You can use your knife and fork to cut and eat bite-size pieces. 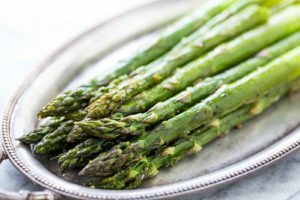 Tricky Food Tip: If you’re not sure it’s okay to pick up the asparagus with your fingers, then opt for the fork and knife or wait to see what your host does with his or her asparagus. If the asparagus is warm, then eat it with a fork and knife. Cherry tomatoes can make a mess. 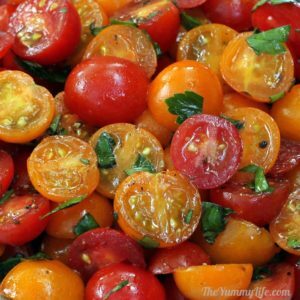 If the cherry tomatoes in your salad have already been cut, then spear the cut side of a piece with your fork and pop it into your mouth. When cherry tomatoes are served whole, the task of getting them onto your fork and eating them becomes more challenging. Simply spearing one with your fork is difficult, as it can quickly slide away from your fork and hopefully doesn’t scoot off the plate and into your lap. To prevent this, use your fork to push the tomato against the side of your knife. Use the side of the knife to hold it steady as you insert the tines of the fork into the tomato. Then pop it in your mouth and close you lips tightly before biting into it. You don’t want seeds to fly out of your mouth and across the table.